She's going to teach players some lessons about playing around Bloodlust. Next month's Rise of Shadow's expansion will see former Hearthstone villains teaming up to create the League of E.V.I.L., and Hagatha the Witch is among the founding members. The character, who was first introduced as the only Hero card in The Witchwood set, is returning in Rise of Shadows as a Legendary minion with a particularly spicy Battlecry effect. Hagatha Swampqueen, to give her birth name, costs 7-Mana and has 5/5 stats. When you play her, a 'Horror' card will be placed in your hand, which is also a minion with 5/5 stats, but this time costs only 5-Mana. Additionally, Hagatha can teach the Horror to cast Shaman spells. These are picked using the Discover mechanic, and the spells can be targeted rather than cast at random. One addendum to this, which comes from Hearthstone game designer Peter Whalen's Twitter, is that when discovering which spells you want to teach your Horror, the first choice is entirely random. However, the second choice won’t have targeted spells if your first choice was targeted. I guess that's to avoid you having to use the targeting arrow twice as part of playing the same card. Among the spells I imagine will be most useful to teach your horror, I expect AoE board clears (Lightning Storm), single target removal (Hex), and direct damage (Lava Burst) to all be common picks. But don't sleep on minion generation spells like Feral Spirit, or buff effects like Bloodlust. We're also yet to see what other new Shaman spells Rise of Shadows introduces. I had a chance to mess around with the Swampqueen on a trip to see the new set a couple of weeks ago, and she's certainly one of the most fun cards in the set, as well as being a potentially massive value generator. The chance to play a 5/5 for 5 which also casts, say, Rain of Toads followed by The Storm Bringer, is huge. 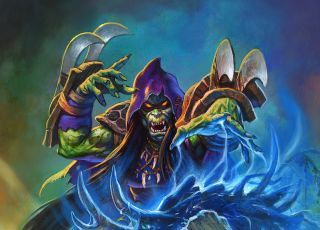 It is of course worth noting that Shaman as a class has plenty of trash tier spells, making it less certain you'll be able to create the kind of Horror you need for the current situation. Nonetheless, Discover is one of the most fun effects in the game, so I expect Swampqueen to be pretty popular. As to her exact power level, it's a little early to say. When played on curve, you're going to have to wait a turn to get the impact from the Horror, which could be fatal against super aggressive strategies, but there's more than a whiff of Kazakus about how she works, and with no deck-building restriction, that's some exciting potential. Rise of Shadows will be released on 9 April, and you can find out more about the set, plus the various pre-order configurations, over at the official site.